Gold production in the West African countries of Burkina Faso, Ghana, Guinea, Ivory Coast, Mali, Mauritania, Niger, Senegal, and Sierra Leone was up 9.3% last year, compared to data from 2010, says the Economics Group’s (MEG) recent Strategic Report. From the nine nations that reported production last year, the largest bullion producer continues to be Ghana, with 47% of the region’s total 2011 production. With the only new mine scheduled to begin production in 2012 — Noble Mining’s 90%-owned Bibiani (Government of Ghana 10%) — Ghana is expected to continue as West Africa’s top gold producer. Mali produced 16% of the region’s gold followed by Burkina Faso at 15% and Guinea at 9%. Mauritania’s production increased marginally in 2011 to 4.5%, while Ivory Coast’s production, representing 5% of the region’s total, almost doubled, as its mines recover from the political turmoil that began in late 2010. The report goes on to say that 70% of West Africa’s gold resources are contained in producing mines. 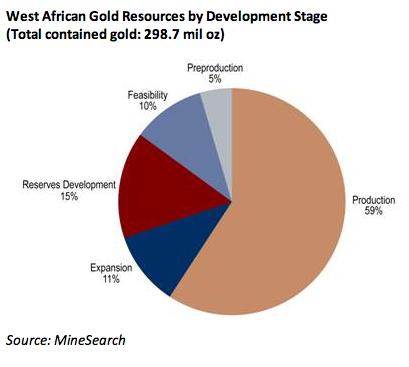 West African gold mines in steady-state production hold 59% of the total gold in reserves and resources in active projects with reported resources. Mines undergoing expansion accounted for an additional 11%. Reserves in development-stage projects hold 15%, feasibility-stage projects hold 10%, and preproduction-stage projects contain 5% of the total. The report doesn't mention the gold situation in South Africa, where bullion output continues to fall, dropping a further 4% by volume in June, according to recent data published by Statistics South Africa.